Jacques Becker (1906-1960), after spending years close to Jean Renoir as his assistant, directed his first films during the Occupation. 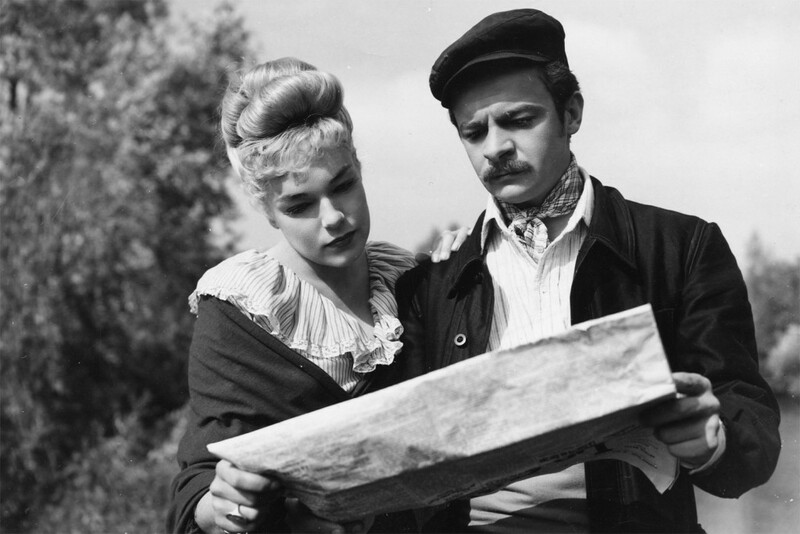 From Renoir he retained a taste for the freedom of play, a love for actors. As opposed to Renoir, he was meticulous to the extreme and obsessed with technical accuracy. Gestures and objects have a trajectory of their own in his thirteen films: see the serial slaps in the face in Casque d’or, the doors opening and closing throughout Falbalas and many other films. A lover of jazz and of American film (and friend of King Vidor, Howard Hawks, Henry Hathaway), ‘vieille France’ like Max (Jean Gabin) in Grisbi, he would switch genres and milieus with the supreme elegance of his Arsène Lupin character. He was one of the most highly regarded and respected directors among his peers. But the feelings were not shared: “I loathe my generation”, he said in 1949. “It is interested only in what is dead. It’s the generation of false pretense. It pretended to love Chaplin: but it prefers Jean Marais. It pretended to love Louis Armstrong: but it prefers Jack Hylton. My generation is bogged down in comfort, in laziness, in the predigested. Nothing else is authentic about it”.There, then, is another side of Becker. One of his heirs, François Truffaut, once drew his portrait as “anxious, distressed, elegant, lyrical, British, nervous, tormented”. As a member of the Resistance, Becker defended H.G. Clouzot and Robert Le Vigan against the hysteria of the post-war purges; as a forty-year-old, he sided with a neglected youth against their fathers; as a ‘professionnel de la profession’, he championed the much maligned Bresson and Ophuls against the then dominant idea of ‘cinéma, notre métier’, filmmaking as craftsmanship. Becker was advocating the right of the director to be the one person responsible for a film, advocating the cinéma d’auteur in a literal sense. In 1957, Max Ophuls, who was terminally ill, designated him to direct Montparnasse 19 in his place. Soon Henri Jeanson, star screenwriter of the film, waxed indignant at his reworking the script and eliminating witty lines: “You have a habit”, he wrote Becker, “of taking on a story and then making another one instead. You didn’t make Arsène Lupin, you didn’t make Casque d’or, instead you made up stories which bore no relation to the original material. Are you capable for once of effacing yourself and shooting our screenplay and nothing else?”. No better definition could be offered of what divided Becker from an industry which he was only a part of technically; and what brought him nearer to the young film buffs who were then preparing to disrupt traditions. All of which might explain why Godard saw Montparnasse 19 as defining the questions of filmmaking, and how Becker gave French cinema its greatest film about rural France with Goupi Mains rouges, its manifesto for post-war youth with Rendezvous de juillet, its greatest film noir (next only to Renoir’s La Nuit du carrefour, on which he had been an assistant) with Grisbi; and with his final masterpiece Le Trou he was, in Serge Daney’s words, “the only one who could film the very idea of freedom”.